CONGRATULATIONS TO 'BELLA' FOR SCORING THE TRIFECTA!! 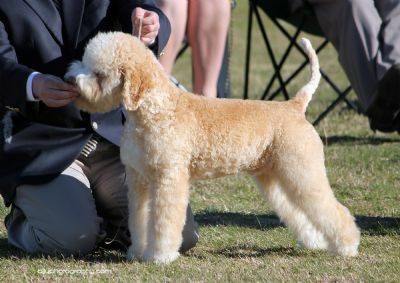 Youngest ever Lagotto to achieve her Grand Championship title. We are extremely proud to have bred Bella, whose heritage speaks for itself. She is a beautiful girl and we are so proud to be part of this historic occasion for the breed. Bella's progeny are also standing on their own four paws and making their own name in the show ring. Ultimately though, our thanks go to Keith for campaigning her and promoting the breed in the way he has. None of this would have been achieved without the time, dedication and efforts put in to show her to her best. Keith and Brooke - thank you both for loving Bella, she was my pick and I am glad she has proven herself. Keith Robinson is currently successfully campaigning "Bella" Grand Ch Nugold Ciao Bella, who has taken out two Best In Groups in the last couple of shows. Bella is a beautiful Brown and Cream girl sired by one of our Italian Imports, Cryout Semola (Imp Italy) (Sam) with the Dam being our show stopping Ch Nugold PeachesNCream (Peaches). 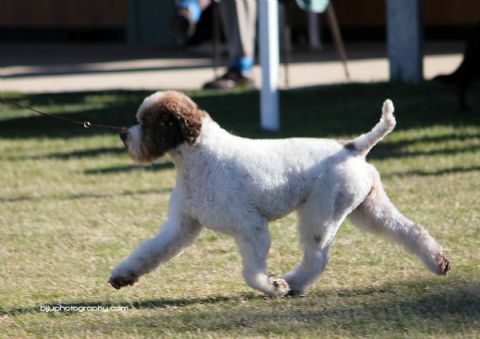 Keith has put a lot of hard work into the showing of Bella, and we are extremely grateful for campaigning her and enabling others to see the lagotto breed in this way. Keith is already well known for his multitude of show successes and most recently for his outstanding show wins with his Lagotti - Ch Kan Trace at Greydove (Dante) and now to accompany that success, he has our Nugold Ciao Bella. Bella had a personality from the moment she could get up on her own two feet and boss her siblings around! Bella was selectively bred and her heritage can be traced back to some of the most well recognised quality Lagotti in Italy. Keith of course deserves all the credit here. Bella has the right pedigree and "heritage", but it is due to the hard work and commitment by Keith to enable more recognition of this most stunning of breeds to be acknowledged throughout not only the show world, but the world of the general public as well. CONGRATULATIONS KEITH ON NOT ONLY TAKING BELLA TO HER GRAND CHAMPION TITLE, BUT FOR CAMPAIGNING HER TO HER Best In Group and Multi Class in Show wins too!! Bella's son is doing plenty of winning in his own right! For such a young boy, he is already accumulating In Show wins and Dog Challenges and he has only just turned 6 months!